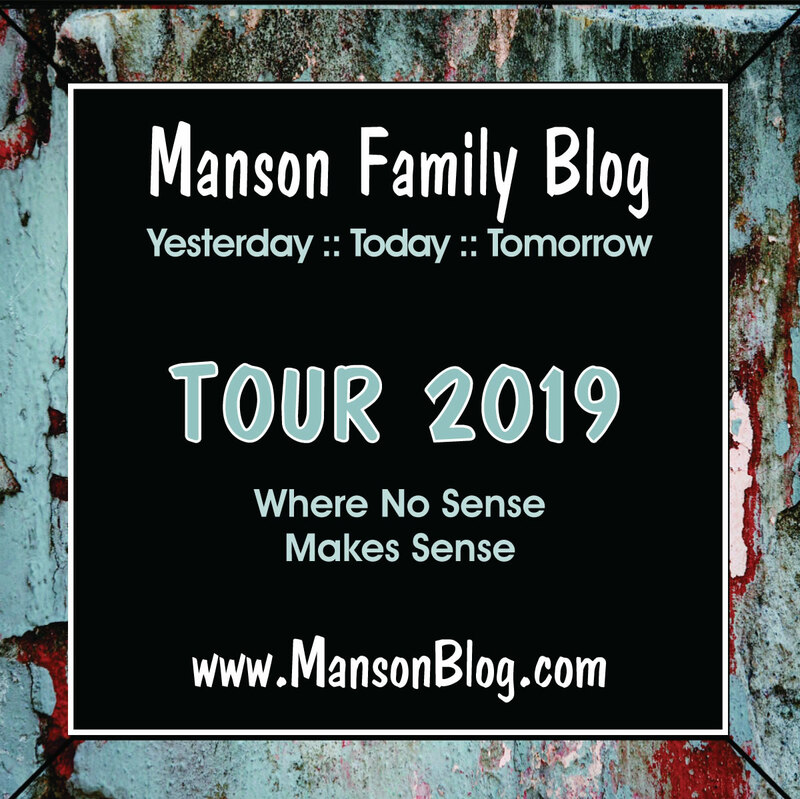 Everyone by now likely knows that not long after the first edition of Ed Sanders The Family came out he and his publishers were sued by The Process for writing untrue things about their group and their connection to Charles Manson. Sanders US publisher settled with The Process. Any books that had been published in the US but not sold had to have a slip of paper affixed to the front end page saying that anything about The Process in the book was bunk. And the chapter about The Process and any other references to The Process were removed from subsequent editions of the book. The case over the forbidden chapter then went to trial in England where The Process was founded and the book was also published. Ed Sanders British publisher attended the trial but Sanders did not. 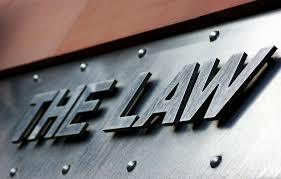 The Process lost the case in England and they were ordered to pay the defendant's legal fees. You can get a copy of the trial transcripts from Aes-Nihil if you want to delve into this further. So, where did Sanders get that story about an "exorcism" of Pussycat by a man named Father P with Charles Manson as a witness to the whole affair, that so ruffled The Process's feathers? 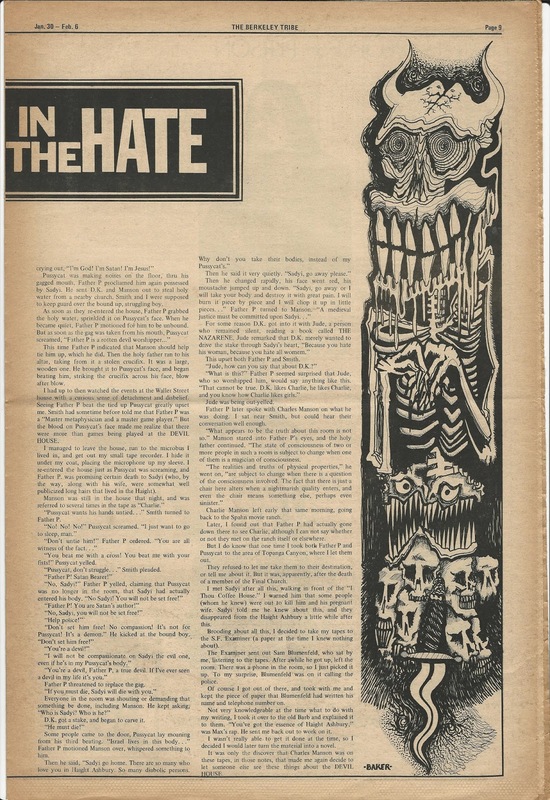 This event was supposed to have taken place at the "Devil House" on Waller Street in San Francisco's Haight Ashbury district. The "Devil House" has alternately been reported as having been The Process's San Francisco headquarters or a building belonging to the Diggers. No one, to my knowledge, has ever claimed that the Diggers and The Process were connected in any way. Also, no one has ever been able to definitively say where the "Devil House" was located, only that it was on Waller. Father P's real name came out in the trial but Pussycat's name did not. Father P has since passed on but no one has learned the name of Pussycat and therefore the veracity of the story has never been tested. I learned from Jon Aes-Nihil that both Father P and Pussycat actually did exist. By some cosmic witchy occurrence Jon met both over New Year's in 1967/8 in Guerneville, yes, that same Guerneville where James Willett was killed! 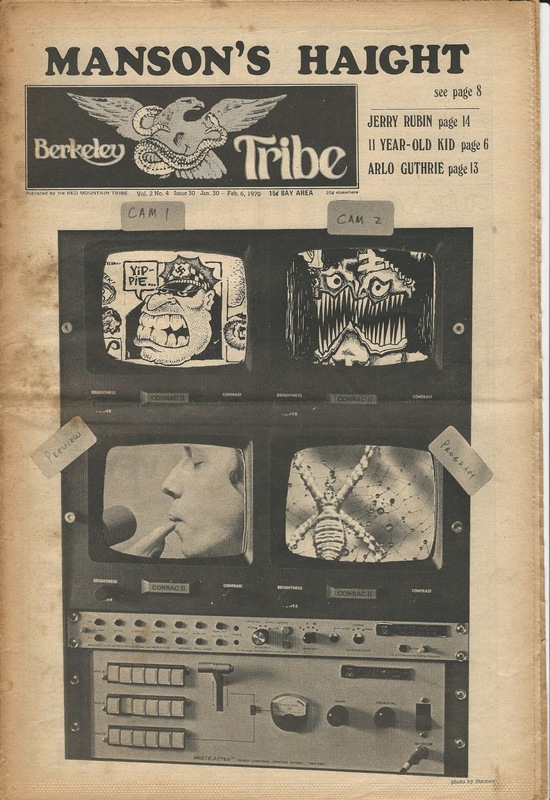 I was able to track down the beginnings of the story and the likely source for the chapter in Sanders book in a January 30, 1970 Berkeley Tribe article. This article was published a good year before Sanders book. So, the questions remain, was Charles Manson present at this alleged event, who is Pussycat and where was the "Devil House"? Guerneville, CA was then and still is a major gay party resort. It must have been freaking wild back in the day! I know that when he printed Ultimate Evil- the author used Sanders a source many times, and Sanders printed quite a few things in his book which were far from proven facts...Neither of them seemed to mind printing things which were not confirmed or proven so long as they both had some relevance and were in keeping with the general themes of chaos and darkness. I know that the Fugs played some of the Acid Tests. Wasn't Sanders around the Haight during this period as well?? How do we know for sure it wasn't Sanders with father P during that ritual?? Is that why Terry was so willing to use Sanders as a source for all his Process stuff??? "This is a very complicated case. You know, a lotta ins, lotta outs, lotta what-have-you's. " P.S.- what could make me think party more than hanging around gay people at a Russian river?? Wasn't The Fugs a fixture on NYC's Lower East Side countercultural scene in the 60's! 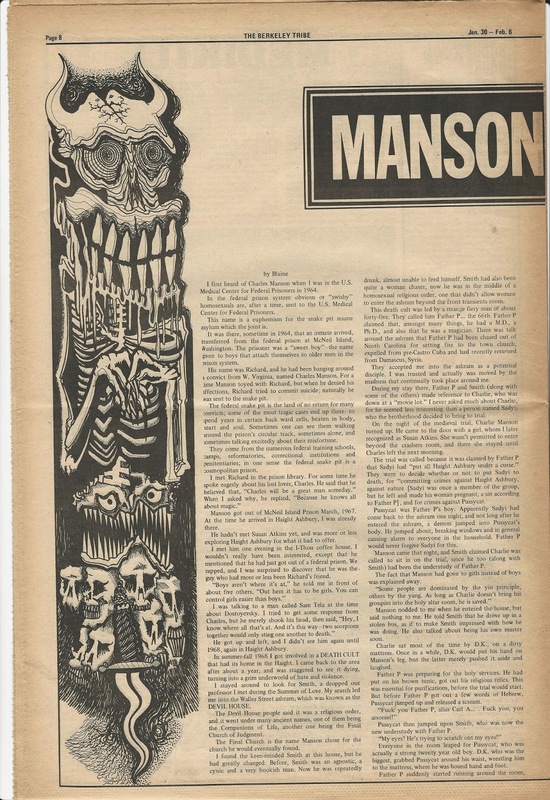 Nice find - a copy of The Tribe with Blaine's Manson "article" in it! Appreciate the reproduction, thank you. Now to answer the rest of your question. - Both have written articles for Berkeley-San Francisco area underground papers. - Both essentially live out of a microbus, Goldcatcher was in 2009! 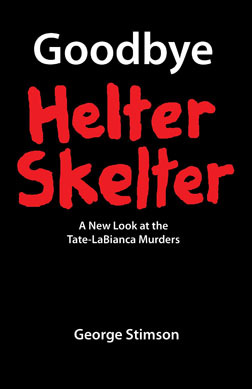 - Blaine-Goldcatcher has a history of attempts to "slander-frame" Richard Gaikowski as an associate of criminals and or being a psychopathic murderer-villain himself. - Blaine-Tribe author talks about a "Richard" and slanders him as having been in prison and Mason's homosexual lover in prison. -Blaine-Goldcatcher is homosexual, and in 1973 was the leader of a severely misogynistic Berkeley homosexual cult professing to worship The Golden Calf. -Blaine-Tribe author talks about belonging to a homosexual death-cult, the setting for the "exorcism of Pussycat" story. However, Blaine & Richard were never in prison together, Gaikowski was never Manson's gay lover nor in prison with Manson. I accept that Father P and Pussycat may have been real people as you say, because Blaine, Richard and Manson were...but given Blaine's "repeated pattern of bizarre behavior, self-promotion, and sensational stories", it's safe to presume none of the depicted events actually happened.